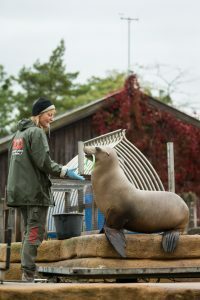 Annette started her 4-year education as a Zookeeper in 1988 & in 1989 she was hired as a trainee at Copenhagen Zoo where she completed the practical part of her education. 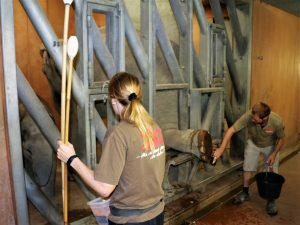 During this time, Annette got the opportunity to work with all kinds of species in the Zoo. When Annette finished her education in 1992, she then got a position at the marine mammal section working with Harbour Seals and California Sea lions and additionally alongside animals like penguins, Malayan tapirs and babirusa … to name a few. From 1993-2008 Annette attended all seminars, courses, and conferences regarding training that she could possibly find and/or get financial support for. Including a field trip in 1998 to the US visiting Brookfield Zoo, Shedd Aquarium, and Sea World Orlando. That trip changed Annette’s life! In 2008 Annette moved to the Elephant section working with Elephants that had just moved from free contact into PC. At the same time, she got the position as Husbandry Training Coordinator. 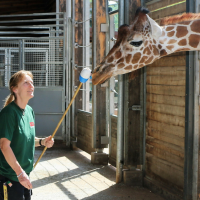 Since 2008 Annette’s job has been to develop slash expand the training skills of the keepers at Copenhagen Zoo, as well as daily problem solving and behavior management with a variety of species and challenges. Since 2009 she has additionally helped develop the Danish Association of Zoos and Aquariums (DAZA) animal training course and serves on the European Association of Zoos and Aquariums (EAZA) as Chair for the Animal Training Working Group and a member of the Animal Welfare Working group. Annette is also an instructor for the EAZA animal training courses under the EAZA Academy. Further commitments include serving on the board of the Animal Behavior Management Alliance (ABMA) between 2014-2016 & today representing ABMA as an EU liaison working towards other European ABMA conference in 2020!